Theatre Square in Camden for Essential Living features in the exhibition accompanying The London Tall Buildings Survey 2019. This annual publication provides analysis on buildings with a height of 20 storeys or more and their contribution to current and future development in the capital. 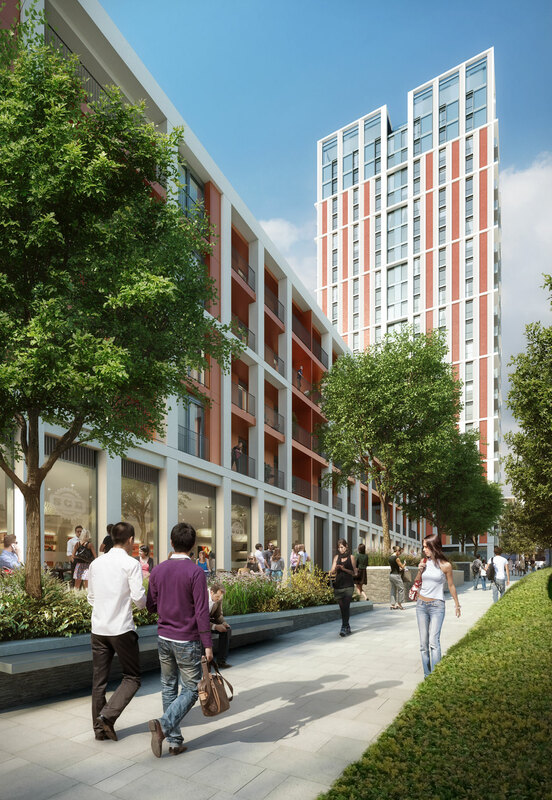 The Theatre Square project will realise a 24 storey residential building for the rental sector with four pavilions and terraces on the upper levels offering shared amenity space and views over London. A 5 and 7 storey mixed-use terrace building will provide private dwellings, an independent community building and retail and café spaces. The design addresses the setting of the renowned Hampstead Theatre and restores the quality of the open spaces, extending pedestrian routes as well as creating new step-free access to Swiss Cottage Underground Station. The sixth research paper has been developed with GL Hearn property and planning consultancy and published by New London Architecture (NLA). The exhibition continues until Tuesday 30 April 2019 at the NLA Galleries at the Building Centre, 26 Store Street London WC1E 7BT.